Our team is able to support all implementation stages and our solution for core administration system has proven its reliability through clients around the world. This system is already implemented on four continents (Europe, America, Asia, and Africa) and has delivered solutions in multiple regulatory environments, across multiple distribution channels and in multiple languages. In this way we deliver innovation and competitive advantage to our clients. 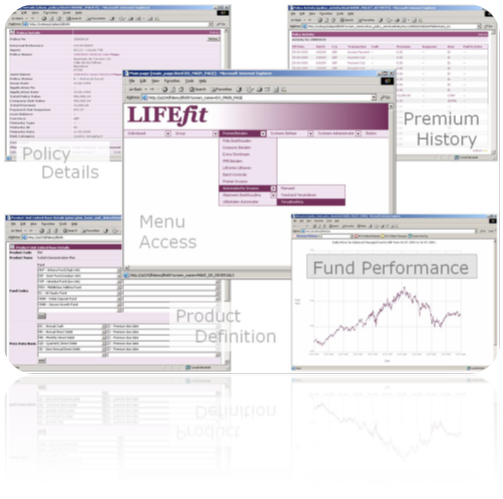 The insurance administration engine is fully customised and adapted to Romanian insurance market and products and support as standard the full range of individual and group life insurance & pension products. It combines a unique insurance product design engine with leading edge technology, to help clients successfully start-up or open new markets, or to lower costs and position for sustained growth. Security - Audit trails, passwords, secure authorisation controls. Web based - A fully integrated web system, accessible over the internet & easy to use. Legacy systems - Evolve into modern secure technology. One integrated system. No peripheral spreadsheets. Document Imaging - Scan, index & retrieve letters, forms, commission statements & photo IDs, for policy and client records. Company originated documents are automatically saved. Workflow Management - Allocate tasks. Prioritise. Measure time. Outsourcing - The tool for flexible outsourcing of life & pensions administration. Compliance - Anti money laundering. Politically exposed persons. Compliance checks. Automated procedures.